Hi everyone! I hope you’ve been enjoying this beautiful fall weather as much as I have! 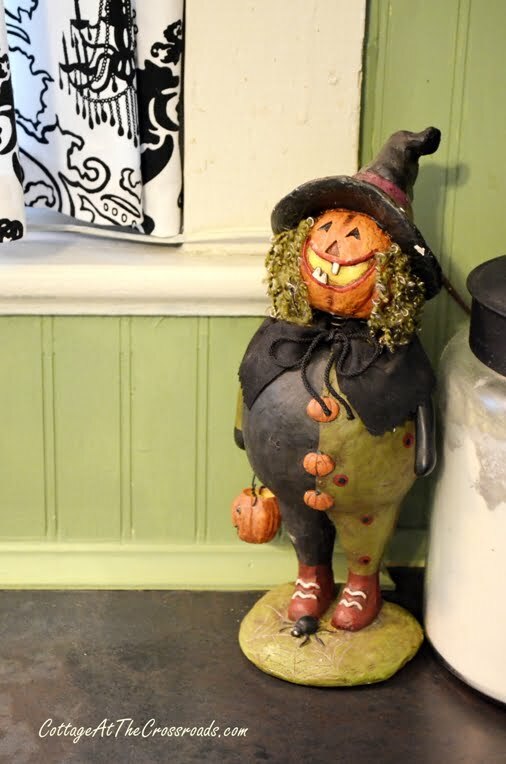 Since it’s almost October, I’m sharing some fun fall decorations that I’ve added to our kitchen. And it’s all part of our “Fall into Autumn” series that Dawn, Ann, Debbie and I have been bringing you the past few weeks. The color scheme in our small, country kitchen is green with black and white accents.If you remember, we added this checked sink skirt this past summer. 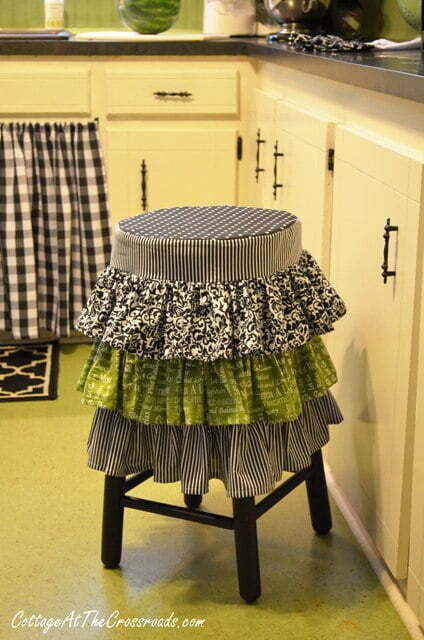 And I added this ruffled stool cover at the same time. So for fall, I just added a little orange to the mix to get us into the Halloween-y mood! There’s a little shelf above the range in our kitchen, and you can see how I added a few orange accents to some of the items that I display on it. With some of the left-over fabric from the ruffled stool cover, I made a little jack-o’-lantern from an old embroidery hoop that I had and it became a totally free decoration! 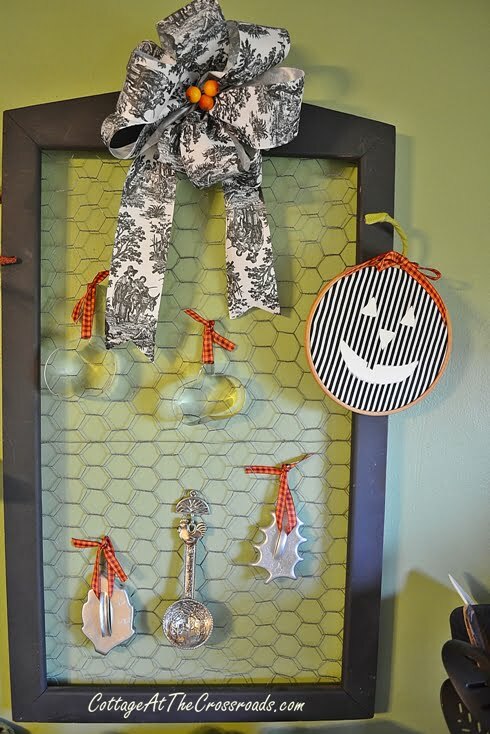 This frame with chicken wire was in another corner of the kitchen, but I moved it over to this area and added some fall shaped cookie cutters and another one of my embroidery hoop jack-o’-lanterns to it. It’s a good thing I pulled out these pumpkin shaped cookie cutters because…. this sweetheart was visiting us this weekend! Ruby got into the spirit and added her own decoration to the kitchen! 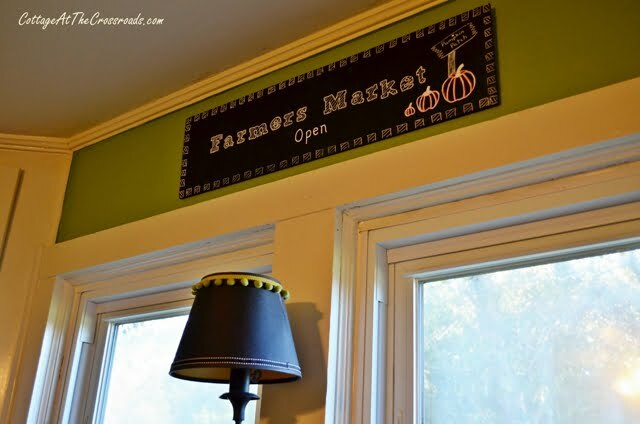 The vinyl chalkboard was made for me by sweet Amy from Atta Girl Says. Yep! Bloggers are like that. As soon as you tell someone you really like something, they are making it and sending it to you before you know it! 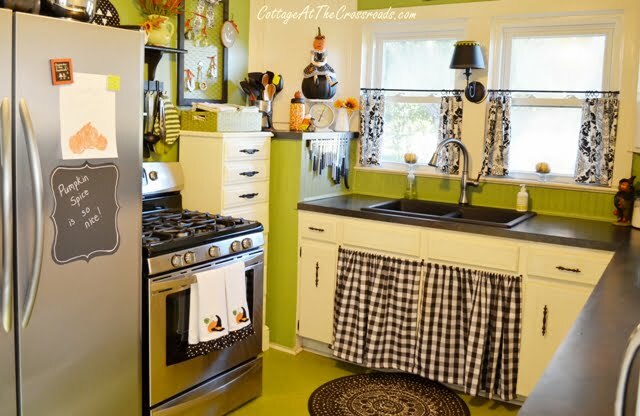 Now here’s an inexpensive way to add some color to your kitchen. 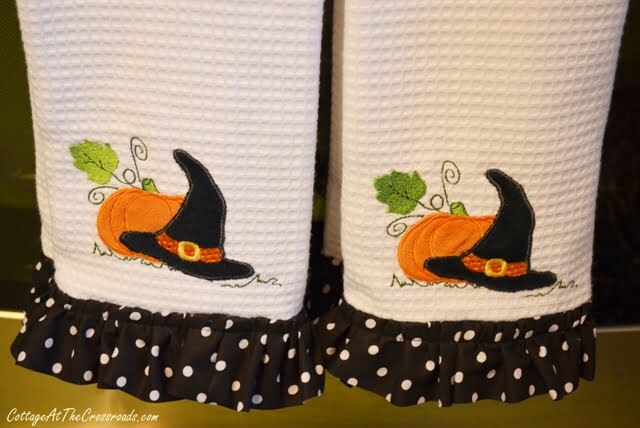 These are some kitchen towels that I purchased from HomeGoods for about $5, and my friend Brenda added the polka-dot ruffles to them. They just wouldn’t have the same impact without those ruffles! At the same time that I found the kitchen towels, I bought this cute plate that I hung on the wall. On another wall of the kitchen is this large chalkboard where I like to put some seasonal displays. 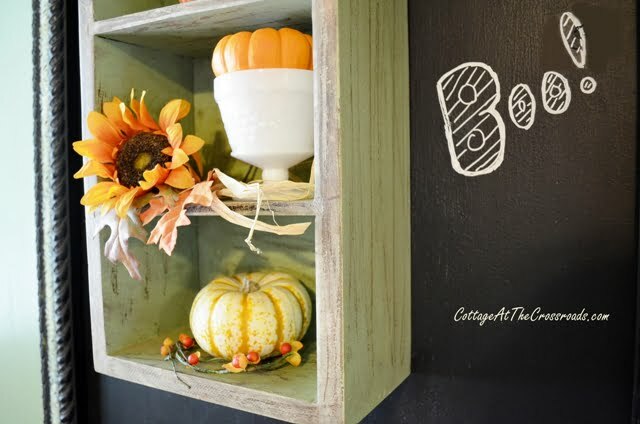 I hung a little shelf on the chalkboard and filled it with some autumn decorations, none of which are new but just displayed differently. On this pizza peel, I hung another kitchen towel. It was easy to add the orange trim by just hot-gluing it on. 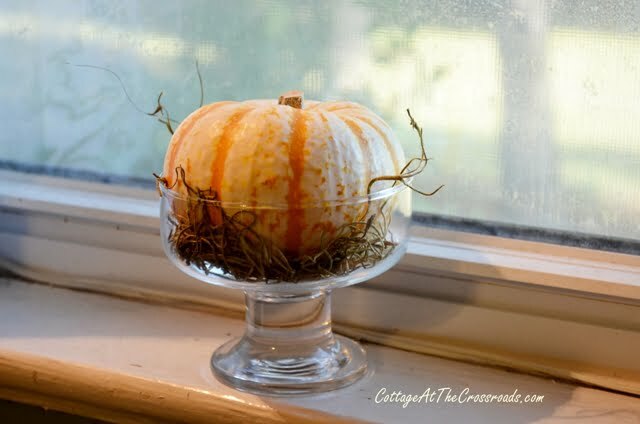 Nothing says fall more than pumpkins, so I put a couple of these tiger stripe cuties in the windows. An old favorite is hanging out on the counter and makes me feel like a kid again! Didn’t you just love trick-or-treating when you were young? In my efforts to decorate inexpensively, I created this little chalkboard sign to hang over the windows. 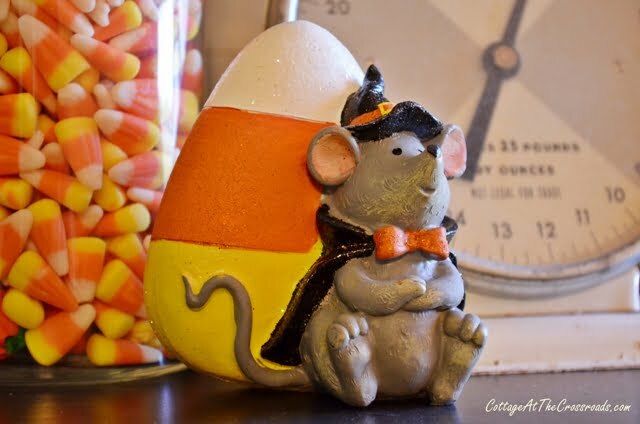 In a little vignette in one corner of the kitchen is a candy corn filled jar with this little mouse. 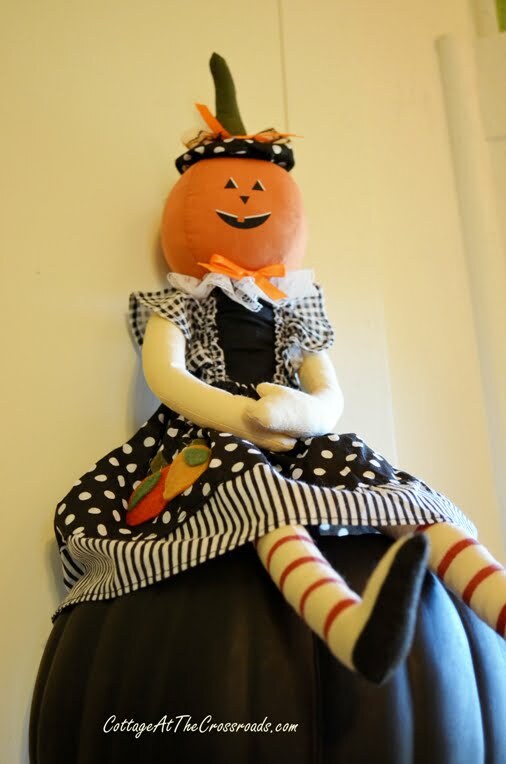 But my absolute favorite new item is this darling kitchen witch who’s sitting on top of the world! I could not have matched her to our kitchen if I had made her myself! Well, I think I’ve shown you all around our fall kitchen except for one place. The top of the refrigerator where Pork Chop is sporting her fall finery! 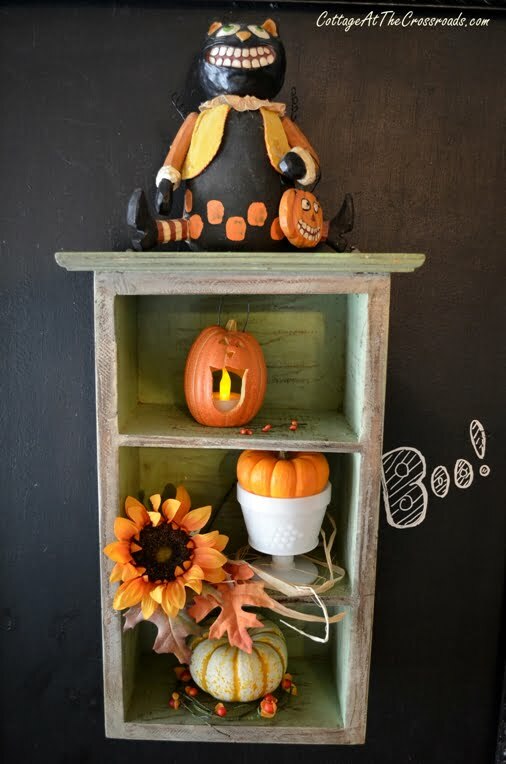 I hope I’ve given you a little inspiration for adding a little “spooky fun” to your kitchen today. 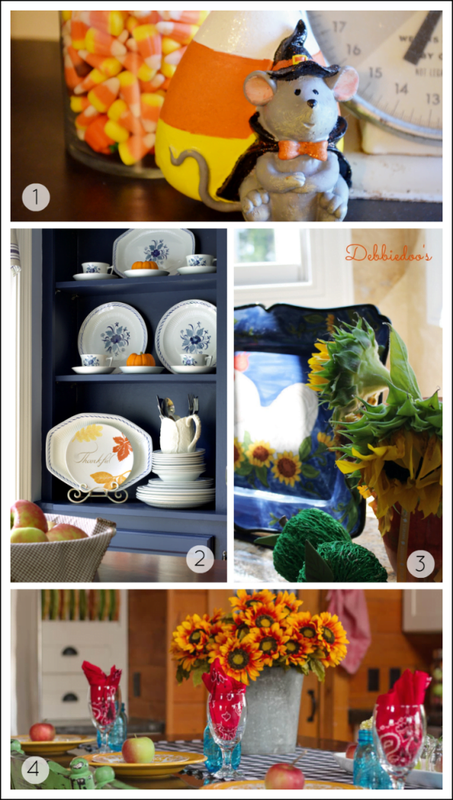 For even more inspiration, check out how Ann, Debbie, and Dawn have decorated their kitchens for fall. The links are below the graphic. 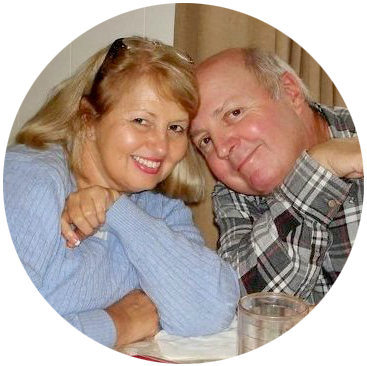 Just happily stumbled upon your blog – even though it is Fall kitchen 2013, I wanted to say how much I love what you have done. I adore black and white decorating as well! 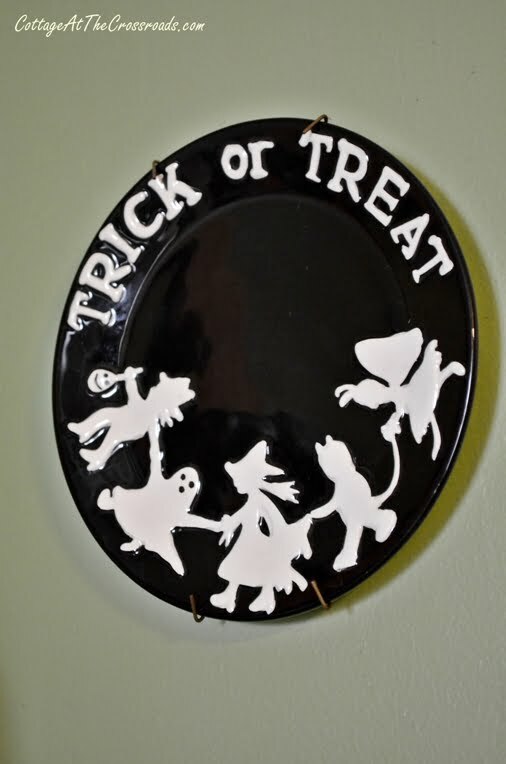 Especially love your ruffled stool cover, choice of fabrics, and the precious trick or treat plate – everyone seems to be out of them this year – 2015. Hi Jane.. . what is the name of that green you have in your kitchen? I love it. soo country green.. Your color scheme already fits right in to this Fall Decor! Love it Jane! Jane, love all; love your country kitchen; so cozy; I would love , if you know the pattern number of the witch on the scale. would love to make one. love the scale too. I would appreciate it. please email me the brand, ex.simplicity, and pattern number. Thanks so much Jane. particulary love the pmpkins u redid. love them. say hi to leo. its good u have a mate who has the same interests. that def. is a rarity. Love, love, love! Where did you find the little kitchen witch? Is it a pattern or pre-made? So many cute things. Love, Love, Love them all. Oh my!! Your kitchen is ridiculously adorable! I really like the towel hanger holder thingy!!! I’m in love with your blog! 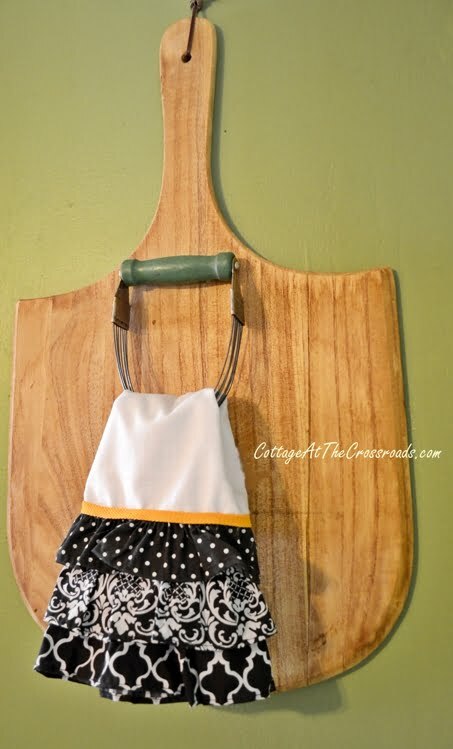 I adore your ruffled stool cover in this post and already pinned it. I added you to my blog lovin’ page so I can follow you. Can’t wait to come back when I have more time to read through your scrumptious blog. It’s hard to pick my favorite item. They’re all so adorable, but if I absolutely have to pick one, it would be your visitor :). I adore all of the whimsy and happiness! The cookie cutters are the perfect touch. 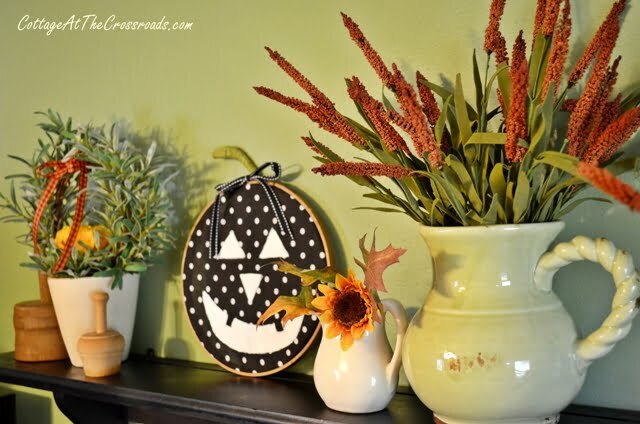 I LOVE your kitchen and it is super cute with all of your fall décor!! Jane, I love love love your darling kitchen! The color is fabulous!!!!! Your kitchen does fall so well, my friend! 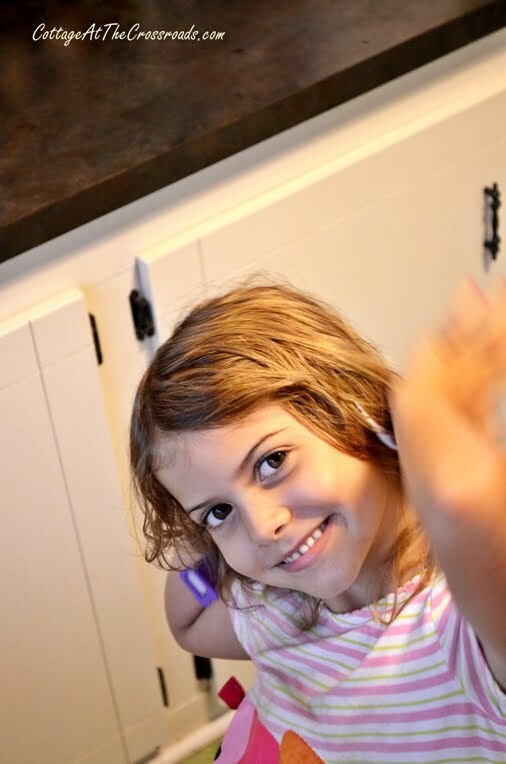 Thanks for sharing your wonderful kitchen at TUTORIALS TIPS AND TIDBITS! Your kitchen looks wonderful….love the cheerful colors and the pops of orange here and there. There are so many things I like that I can’t narrow it down to just a few…but I will try! 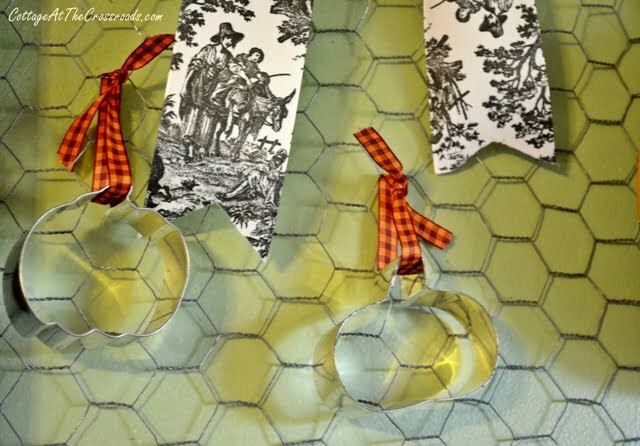 The ruffles on the towels…the trick or treat plate…the toile ribbon. It’s all just wonderful and really fun. Which is what Halloween should be. Fun. Good job! So over the top cute Jane!! I was laughing and smiling all through your photos, the witch sitting on top of the world is so adorable! Love your ruffled stool and everything else too! I adore what you did with your kitchen. It looks so cute. First off I love your little visitor she is adorable!! I really adore all of your fall touches. Your home is always so beautiful! How cute!! What a fun kitchen Jane! I love everything about this kitchen!!! it is gorgeous!! 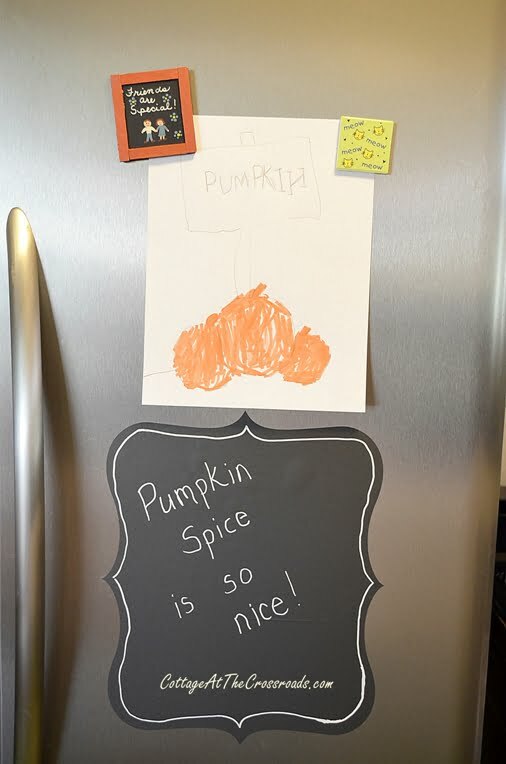 Your kitchen looks adorable and I’m sure it is fun to cook in and enjoy the fall motif. So cute, Jane! Love your green, black & white, and you added just the right amount of orange. Love the embroidery hoops too! Great ideas! Pretty and whimsical and fun. Lovely! Well done!! Jane, your kitchen looks awesome! Love what you have done! 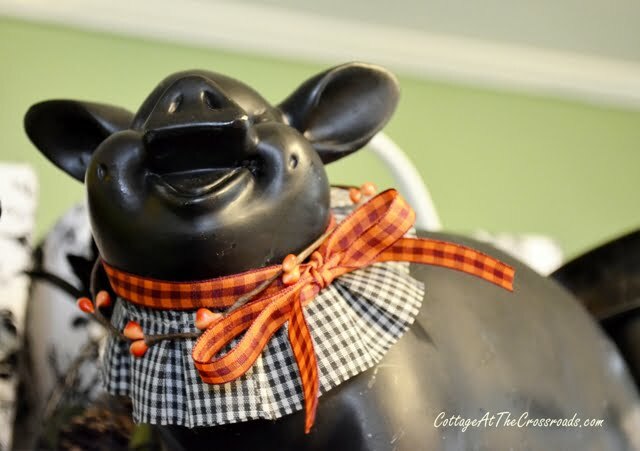 Pork chop is so cute dressed up for fall, she is smiling because she is happy with her fall finery. Thanks for the inspiration! 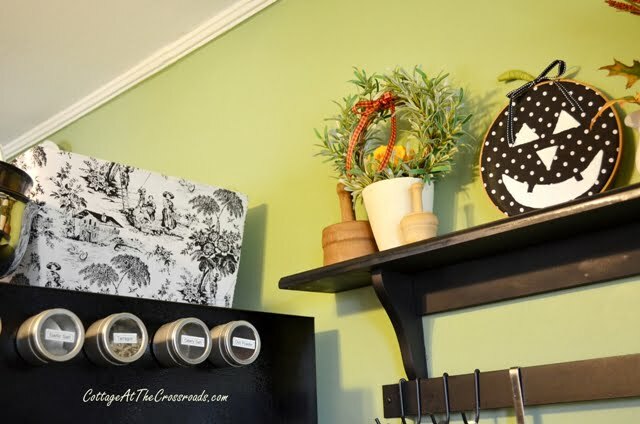 You have done a wonderful job adding some Fall décor to your cute kitchen…luv those cookie cutters! Love your kitchen ! 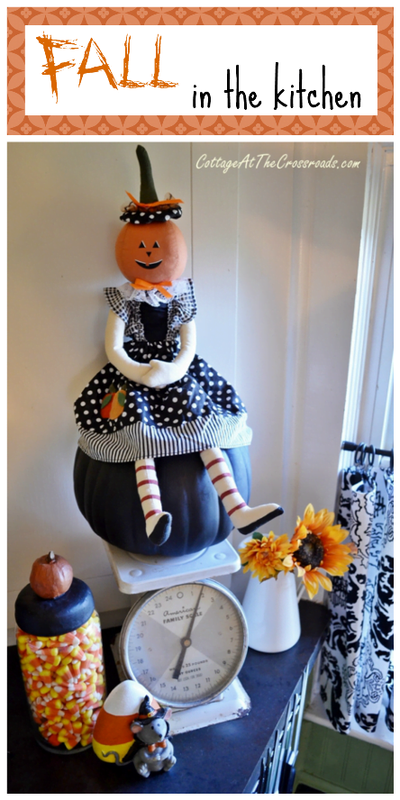 Looks so fabulous with your Fall decorations ! Those embroidery hoop pumpkins are the cutest pumpkins I’ve ever seen! LOVE them! Your kitchen is so inviting! Everything is just adorable! I always love that stool with the ruffled skirt. Your colors are wonderful. So flippen cute Jane. I have the same exact scale. I can’t believe I never noticed that before. Your chicken wire board is adorable too. Everything is!